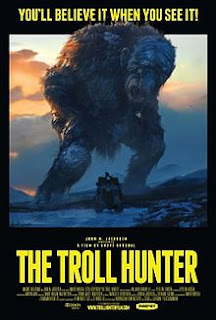 I recently had the chance to watch The Troll Hunter, a 2010 Norwegian movie that blends dark humor with a touch of horror. It's available through Netflix streaming, so that gives me a lot of flexibility to catch a movie when the kids are asleep. The movie is presented as "found footage", a mock documentary that details how a group of university students investigate ecological concerns around illegal bear hunting in the mountains. When they start trailing one of the hunters at night, they learn he's actually hunting something much larger and more dangerous than bears. Trolls are real, and they're migrating out of their ranges and munching tourists! Over the course of the movie, the students enter the confidence of the troll hunter, a grizzled ex-soldier, and learn the secret history of the TSS, Norway's Troll Security Service. They learn about troll baiting, troll ecology, and how the government keeps them secret and isolated. The central mystery is about unraveling why various trolls have gone on a rampage. The title of this post is a line delivered by the actual Prime Minister during a discussion on energy policy, which the film makers humorously worked into the context of the movie. 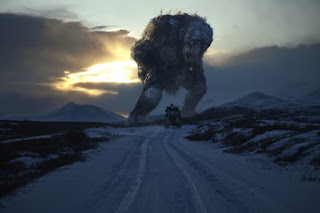 The Troll Hunter has a lot to offer as inspiration for both fantasy and horror games. First there's the central character, the iconic monster hunter. There's a literary and cinematic tradition of the hardened outsider that understands the nature of the foe, the necessary weapons and methods to hunt and destroy the beast. I'm not giving it a lot of deep thought right now, but the first two that jump to mind include Van Helsing from Dracula, or Quint the shark hunter from Jaws, with his finger nails scratching the chalkboard - "Y'all know me. Know how I earn a livin'. I'll catch this bird for you, but it ain't gonna be easy. Bad fish. Not like going down the pond chasin' bluegills and tommycods. This shark, swallow you whole." The troll hunter roams the scenic Norwegian wilderness in a beat up truck and fifth wheel camper, loaded with ingredients to make troll musk, ultraviolet light weaponry in various configurations to blast trolls to stone, and a stereo system with external speakers to play the kind of music that drives trolls nuts, like You Have a Friend in Jesus. The other angle I enjoyed in the movie was the scientific exploitation of myth and folklore. The movie takes certain aspects of troll folklore, assumes it's true, and then goes on to explain the "Monstercology" behind the folklore. And the troll hunter takes full advantage of the troll's vulnerabilities and weaknesses, such as having a pint of "a Christian man's blood" in a container to use as bait. The trolls can tell the difference between how believers smell and the pagans, you see. Highly recommended; it's a low-budget sleeper with a lot of charm, and be sure to see the Norwegian original before the inevitable American remake - apparently an American film company already has the rights. So wishing Netflix operated in the UK. Troll Hunter is also available in the UK on LoveFilm, or Zune if you've got an XBox 360. Great summary of the film - I also particularly enjoyed the "Monsterology". Its one of the few movies that I have seen lately that made me want to add its monsters as-is into my campaigns. It did not hurt that my campaigns are predominantly set in the western Norwegian countryside either. The temptation to force my players to loudly sing cheerful Christian songs to survive against what got to be 10-30 HD beasties is overwhelming. Sweet, I'll have to check it out this weekend! It's a good film. The "monsterology" (or "narturalism") of it I think is something well worth considering. Of late, there has been a trend toward unique/unknowable monsters--a Savage Sword of Conan or eldritch horror sort of approach. Like with a lot of trends, it was response to some dissatisfaction with Gygaxian naturalism--particular to the 2e "ecology of" level. People felt it made monsters too mundane maybe. I think, however, there is value you to both approaches when well done and neither is superior. It depends on the setting as to which is best. Here you see clearly the trolls still being horrifying and interesting, despite being approached in a observational, empiric fashion. I really enjoyed this movie. MiB crossed with Cloverfield, but good. I also enjoyed this film a great deal, and I was pleasantly surprised at how satirical it was. I saw this a few months ago. Well worth the watch, IMO. Here's my own review of Troll Hunter. I enjoyed yours! The part where the new camerawoman shows up is probably my favourite.